Let's go MG, great win! tenthreeleader: A big boost to morale and a huge boost to our chances of qualifying now! Justice: We’re coming for you Europe! 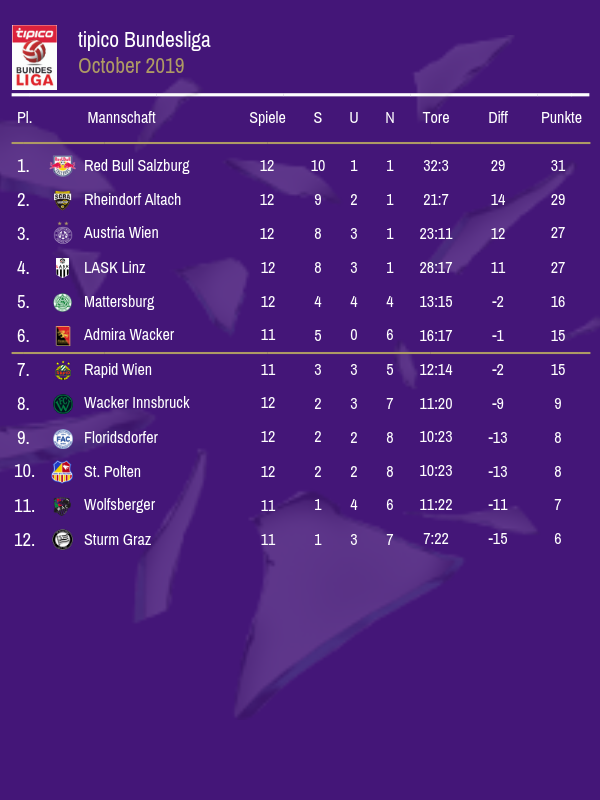 A four point gap is manageable, as Salzburg are bound to drop points at some stage of the season. Hopefully you'll be in a position to capitalise when they do. A good recovery after a demoralising result against them, so it shows that the character is there. You're right up there, very few points separating you and top spot. RB Salzburg seem to be in a world of their own but I imagine you can stay in touch. Die Vielchen’s hopes of progressing to the knockout stages of the Europa League were left hanging in the balance by a disappointing defeat at the Generali Arena against Belgian side Standard Liege. 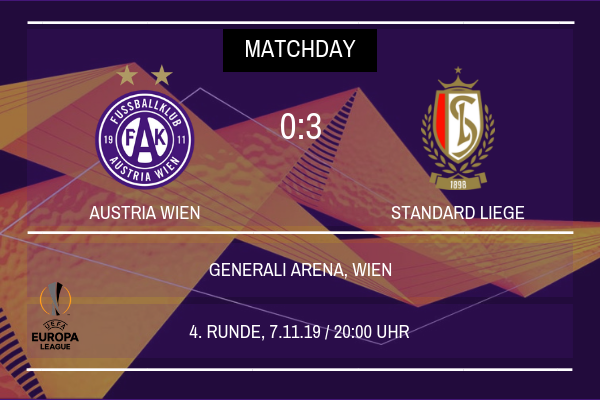 Having kept their ambitions of progression alive by beating the Belgians 1-0 away in Liege, Austria Wien were hopeful of picking up a positive result at home against Standard but were brushed aside comfortably meaning Christopher Steegmann’s side are yet to win at the Generali Arena in European competition this season and Die Vielchen are now up against it with two games remaining in the Group Stages of the campaign. After four games in this campaign, Group H though is still extremely tight with just a single point separating Standard in first place and FC Basel in fourth place in the group and Die Vielchen still hold their destiny in their own hands, knowing that if they pick up positive results against both Olympiakos and Basel on Matchdays 5 and 6, they will qualify for the Round of 32 of the competition. Steegmann and the Austria fans remain defiant though, especially with Die Vielchen being ranked the lowest seeded side in Group H at the break of play back in September. However, here at the Generali Arena, it was doom and gloom for the hosts as early as the eleventh minute as Razvan Marin fired home a powerful effort before Samuel Bastien doubled the visitors lead with a tap in from inside the penalty area in a vicious double blow. The game had begun similar to the heavy thumping Salzburg handed out at the Generali Arena only a few weeks back and the tension was palpable inside Die Vielchen’s home. Meanwhile Austria attempted to push forward in search of a way back into the tie, but their hopes seem to fade when Alexander Grunwald missed a 62nd minute penalty after which Steegmann claimed it may be time for Die Vielchen to think about changing their designated spot kick taker. Samuel Bastien’s late strike in the dying seconds of stoppage time was the icing on the cake for Standard as they sealed an emphatic victory. It means that after the latest round of results, Standard Liege have moved up to first in the group, with six points from their four games in the group, whilst Die Vielchen slide down into third with five points to their name. Meanwhile in Piraeus, Olympiakos put 3 past Basel in a 3-1 victory over Basel, to move into second and send Basel bottom of the group, although both sides, alongside Austria Wien now have 5 points after four games. On Matchday 5, Die Vielchen will host Olympiakos at the Generali Arena, whilst Standard Liege will host Basel as all four sides look to cement their bids to qualify. ScottT: We’re going to have to put together a really strong run now and hope they do slip up but I know we have more than enough quality to go on and do that! Justice: They’re certainly not untouchable and we can definitely close the gap on them! That's a tough loss to take and really does leave the group at a point where it is all to play for. I thought it would quite an unpredictable group, as the balance of teams are quite similar and therefore it leaves it wide open. Fingers crossed you can bounce back. Squeaky bum time, as Sir Alex would say. Time for your squad to show its quality! 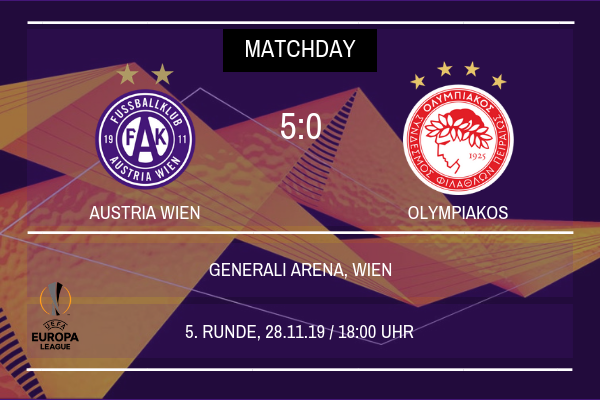 Austria Wien will know that their hopes of qualifying for the knockout stages of the Europa League lie in their own hands and that their destiny in the competition will be decided on Matchday 6 after Christopher Steegmann’s team hammered Greek side Olympiakos by five goals to nil at the Generali Arena. 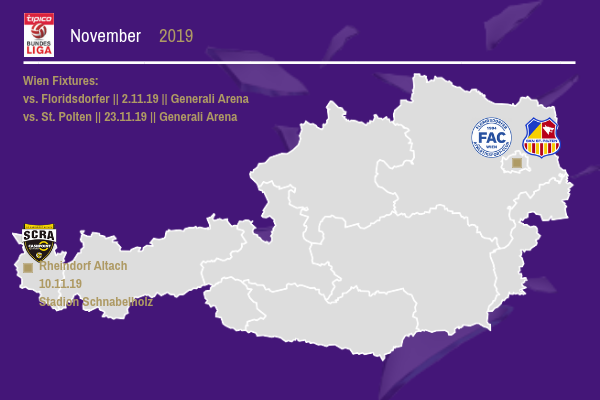 It was a thrilling performance from Steegmann’s team as they gave their Greek visitors little hope of picking up any points in the Austrian capital, with the win being Austria’s first win at the Generali Arena in European competition this season. Group H will now go right down to the wire with all four sides still being able to qualify for the knockout stages of the competition as the final matchday approaches. 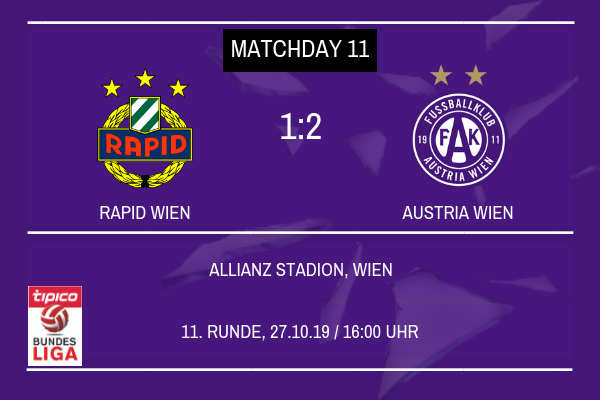 Perhaps significantly for Christopher Steegmann and Austria Wien, the German will consider this game to be Austria’s best performance of the season, with the performance notably coming as Steegmann was able to name his first choice midfield and attacking line up for the first time since the 3-1 victory over Mattersburg at the Generali Arena back on September 14th. The front four of Lucas Venuto, Alex Grunwald, Dominik Prokop and Bright Edomwonyi looked devastating going forward and caused Olympiakos a whole host of problems and Steegmann will be desperate to keep the quartet fir for the remainder of the first half of the campaign as Austria look to continue hunting down Salzburg in the Bundesliga and seal their place in the last 32 of this competition. With Olympiakos looking to retain their own interest in a place in the knockout stages, their hopes were given a huge blow as Alexander Grunwald headed Die Vielchen in front with a rare headed goal for the club skipper as he looped Michael Madl’s free kick over the head of the Greek’s goalkeeper Walke. 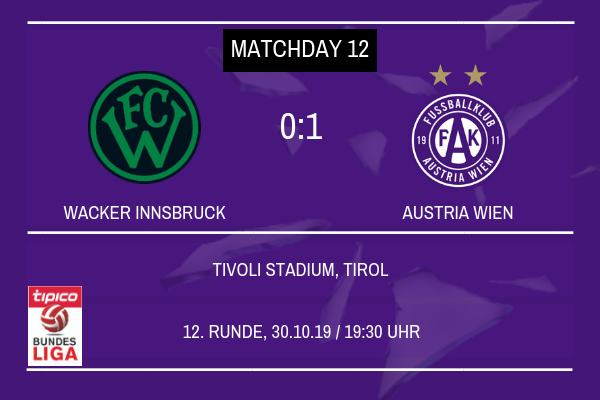 Austria Wien were causing all sorts of problems for the visitors going forward after taking the lead and it looked for all the world that they should have gone in more than a goal ahead at the half time whistle with Bright Edomwonyi and Lucas Venuto creating good chances but Walke standing firm to keep the hosts out. However everything would change in the second half. 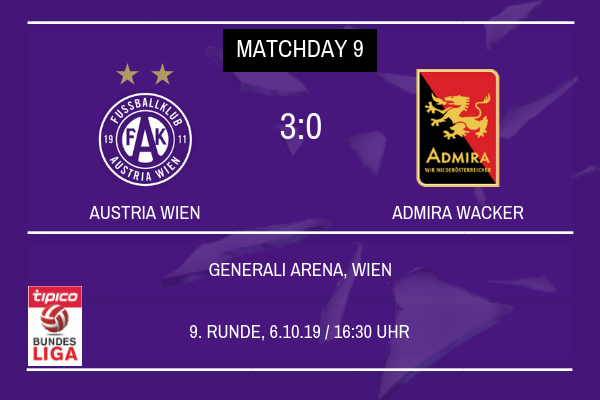 Just before the hour mark, Alexander Borkovic would score his first senior goal for Die Vielchen with a bullet header from Alex Grunwald’s corner sending the home fans crazy as it began to look they would take the three points here. A chaotic six minutes followed as Vlasis Kontis was then sent off in the 61st minute for receiving his second yellow card, before Die Vielchen not only added their third of the game but their fourth too. First James Jeggo converted from the penalty spot with a cool calm spot kick to make it 3 and seal all three points, before just a minute later Lucas Venuto drilled a low cross into the penalty area to find Bright Edomwonyi who slotted home to score his ninth goal of the season and make the scoreline more emphatic. With Marcel Canadi warming up on the touchline, Alex Grunwald placed his final stamp on the game by delivering a beautiful aerial through ball to Kevin Friesenbichler, with the forward running into the area and driving the ball hard and low past Walke to make it 5 and ensure the celebrations would go long into the night for the home fans. 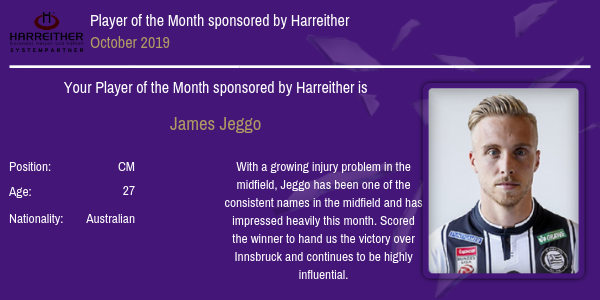 The home fans and Steegmann were visibly delighted at the full time whistle as Steegmann knew that his team now controlled their own destiny heading into Matchday 6, with Die Vielchen having managed to bounce back well from the disappointing defeat to Standard on Matchday 5. 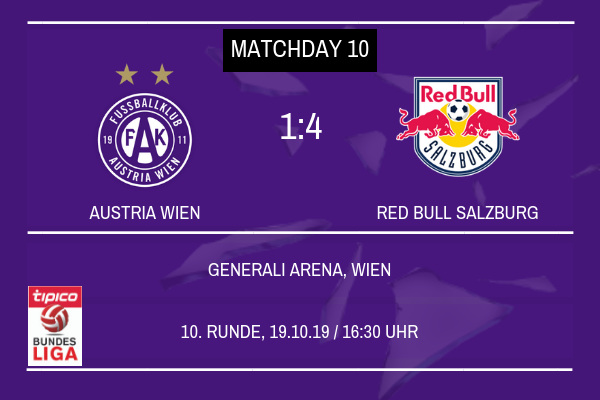 With just the one game remaining in the Group Stages, Die Vielchen now that a victory away in Basel on Matchday 6 will send them through as the winners of Group H regardless of the score in Piraeus in the game between Olympiakos and Standard. A draw in Basel could be enough for Austria to qualify if Standard fail to win in Greece. However only Die Vielchen will be able to control their own fate and decide whether or not qualification is secure and those Die Vielchen fans who travel to Switzerland in two weeks time will be desperate to see their team progress. 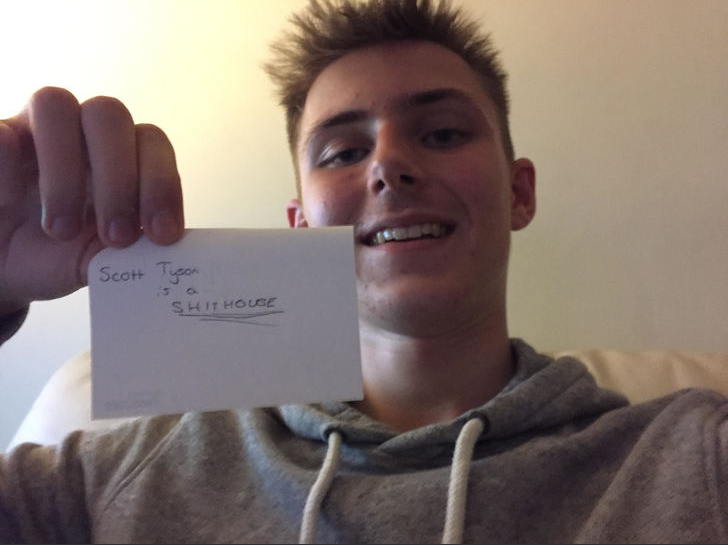 ScottT: It’s a bitterly disappointing result especially given that we were the home team. It really could go either way with any of the four teams in a position to qualify we’ve just got to take our league form into the remaining games! tenthreeleader: Haha squeaky bum time indeed, the boys will step up I have faith! That is a cracking result and a great response to being knocked down in the previous game. To be in a position where the fate lies in your hands is excellent! Hot to shut down the haters: absolutely humiliate a household club. Well done, good sir! The best way to respond to a tough result is to knock your next opponent into next week. This, you have done. Good on you!